Wildlife parents will not abandon their young when they are touched by a human. This is a myth. If it’s a bird or squirrel, return it to the nest, if possible. Keep pets inside. Keep children away. Leave the animal alone and the mother will return for her baby. Kidnapping: A fawn has spots for a reason. It is camouflaged and designed to be alone the first two weeks of its’ life while the doe (who is not far away) stays away so that she does not attract predators. Unless you see clear signs that there is a problem, leave it alone and stay away from the area. The doe will move the fawn within a few weeks and when the fawn is able to follow her. This is true for most species!!! Baby animals need a special diet, take lots of time to raise properly and eat often. Wild animals that are kept and then released often die of starvation unless properly rehabilitated. What should you do if you find a wild animal? Is it truly orphaned? see signs below. Wear gloves when picking up wildlife to protect yourself and the animal. Put the animal in a safe (away from pets and humans) place and keep it warm using blankets, towels or a heating under the blanket set on LOW. Try to handle the animal as little as possible. Stress is the #1 killer of rabbits in rehab. 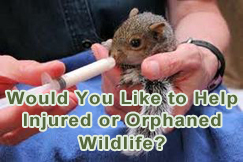 Never offer food or liquids to the animal until you hear from a rehabber. A cold animal will die quickly if given anything to eat or drink ( even water). If the animal is warm, offering it dribbles of warm pedialyte is OK. Never give a wild animal cows milk! In shock in which you will place a thick blanket over the animal and put in a ventilated secure box or animal carrier. Very frightened in which you could be severely bitten or scratched. Wrap the animal tightly and keep the face away from you. Unconscious that may be temporary once you put it in a secure place. Make sure it is secure! Keep animal out of light, quiet and do not feed it or give it anything to drink. An animal is limping or seriously favoring a leg.